I almost hate to say this, because I know there are MANY people out there who disagree, but I like boxed cake mix. It can be used to make lots of things besides cakes and comes in so many delicious flavors. We’ve been making a big effort to eat healthier around here lately, but I believe in moderation rather than deprivation, so sometimes cake makes its way in there. I came across this recipe from Big Red Kitchen this morning, which was the catalyst for everything to follow. It sounds delicious as is, but my mind immediately spun toward one of my husband’s favorites – carrot cake. He finished my living room today (yay - photos to follow after I mop the floor!) so I was happy to be able to show my appreciation through sugar-loaded baking. The original recipe above only uses two ingredients. I used both of those, but added a few more of my own. Combine the dry ingredients, then add the wet. Mix until combined. 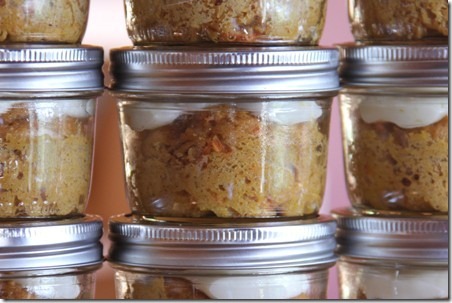 Pour into a muffin tin or 12 small canning jars, sprayed with pan spray. The batter is very thick, so you’ll want to spread it out a bit. 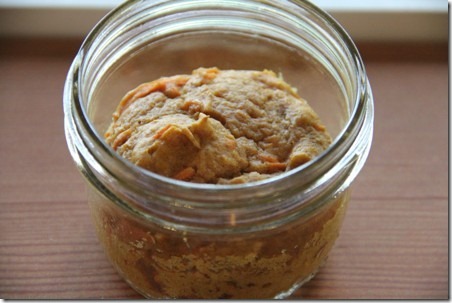 Bake at 350 degrees for 30 minutes if you’re using jars. It will probably take less with a tin. I originally planned to sprinkle these with powdered sugar and stop there, but I knew the family would like them better with cream cheese frosting. Unfortunately, or fortunately as it turns out, all I had was a tub of pineapple cream cheese. Combine the cream cheese and powdered sugar with a mixer, adding milk as necessary to gain the desired consistency. Frost cupcakes. I can’t even begin to tell you how good these are. They’re a little sweet, so next time I’d probably use plain cream cheese, but the pineapple flavor with the carrot cake is worth it. It also makes them rich enough that one is enough, which is a good thing when it comes to desserts. I put them in the refrigerator a couple of hours before anyone ate one, and they’re especially good cold. I’m anxious to try these with some other flavors and fruit. Chocolate and banana anyone?